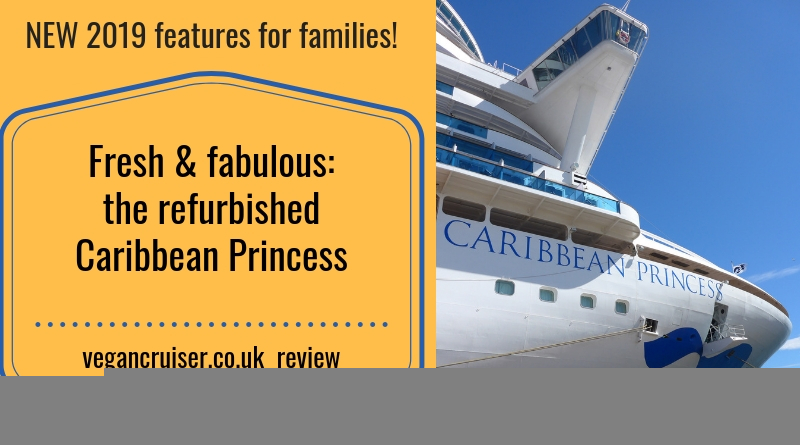 Caribbean Princess refurbishment 2017 & 2019: How good does she look? 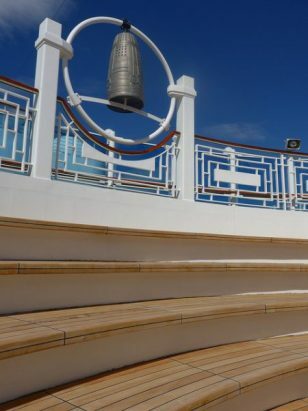 Refurbishments of cruise ships are always exciting news for the new upgraded features onboard. 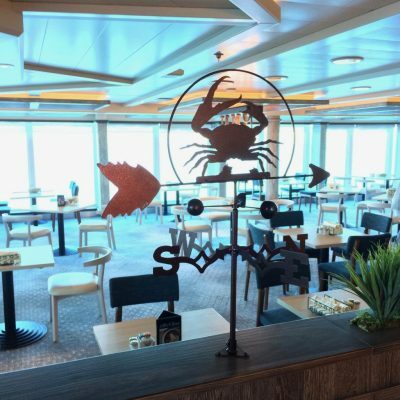 This month we received more news on Princess Cruises’ Caribbean Princess refurbishment for summer 2019 and the amenities to be added onboard – news I was excited to hear about and believe many more will too. I was able to visit Caribbean Princess in Greenock in spring of 2017 just as she had finished her 2017 dry dock refurbishment. This is the edited version featuring both news of the 2017 upgrades and at the end of the post, you can learn about the fresh new additions for 2019. Before she could commence her Britain & Ireland summer 2017 season, Caribbean Princess received a two-week multi-million refurbishment in the Bahamas. But how does she look? Certainly more impressive with the Princess Cruises’ blue Seawitch livery painted on her hull. Previously she was just ‘dressed’ merely in white. 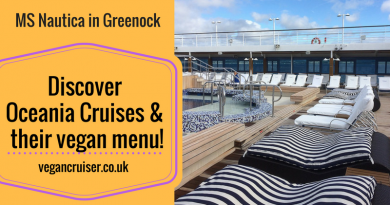 The 8.2million dry-dock refurbishment finished on April 6th 2017 and exactly one month later Caribbean Princess had her first Scottish port visit of 2017. This initial sailing had commenced in Southampton, calling at Cork and Belfast before crossing from Northern Ireland to Greenock. As the passengers headed out to explore Scotland, our small group of visitors was met by Princess UK press office for a tour which gave us a brief overview of the extensive refurbishment. A lot of work has been carried out, some instantly visible while other changes are not immediately obvious to the eye. There have been great reports on the 3000 brand new Princess luxury beds installed (these are the now found on many others in the fleet as a refurbishment feature). Anyone who has ever had the pleasure to sleep on the new Princess beds have discovered the best sleep on the seas. Honestly, I am not exaggerating. My Princess bed on sister ship Crown Princess was just heavenly. Ask anyone, they’ll agree. The atrium, or the Piazza as it is called, is instantly recognisable. It seems very little has changed on the surface as the design of the three-storey atrium and its venues seem the same. However, upon closer inspection, you will spot that there are screens on the walls that weren’t there before. This is because during the dry-dock Caribbean Princess was made Ocean Medallion-ready. All the required technical adaptations have been carried out for the launch of Ocean Medallion in 2018 Caribbean sailing season. 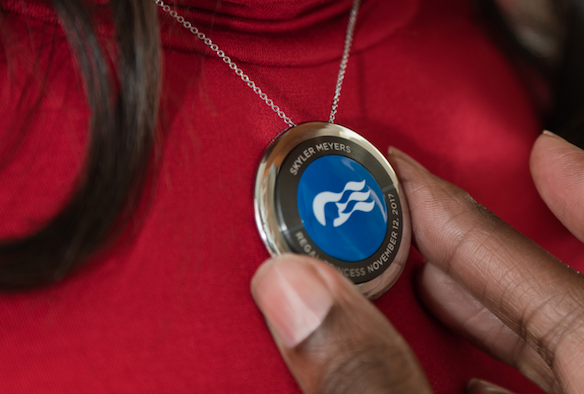 And if you don’t yet know what Ocean Medallion is – read all about this exciting wearable technology here and how it can enhance your cruise experience. I myself cannot wait to see how this beautiful piece of tech will work. A fabulous piece of interactive kit which in my opinion is totally directed at us younger cruisers… and geeks. Not necessarily your average Princess customer but we (younger passengers and gadget geeks) are the future of cruising. IMO. 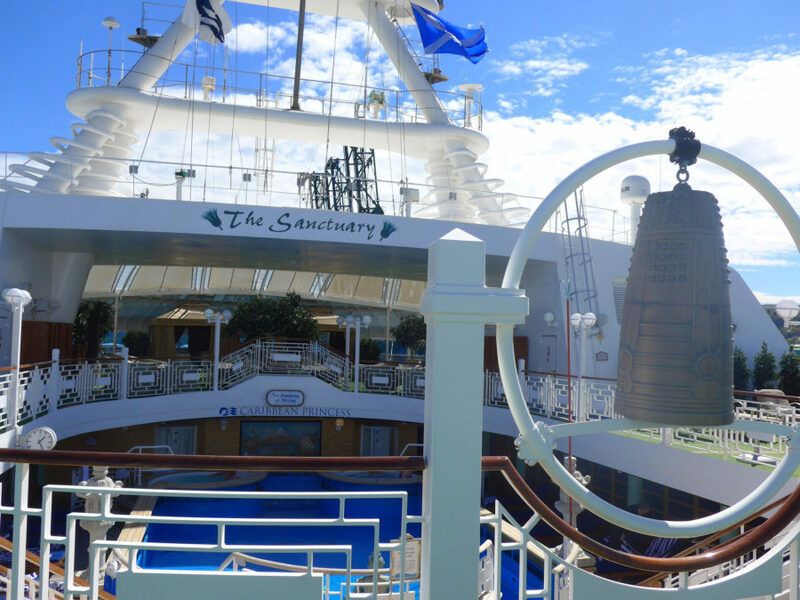 Ocean Medallion will definitely enhance the cruise experience and make it more personalised. I can’t wait to get to play with it and create my own avatar or order drinks on the deck from my smartphone. Plus it is an item of beauty compared to the wristbands used by other cruise lines in the past. So there are areas that haven’t changed but those that have, the difference is stunning. 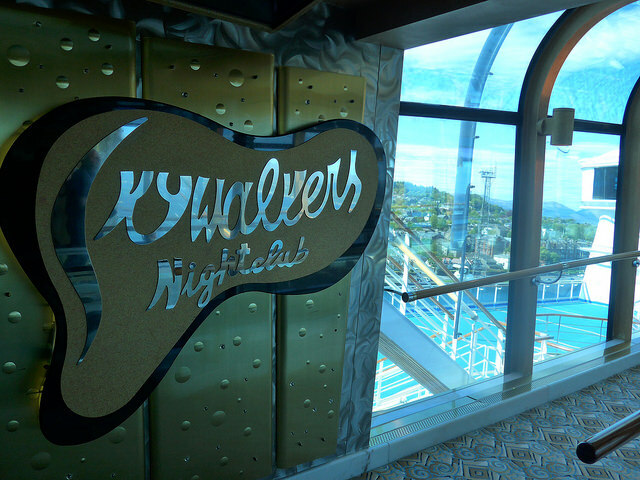 The fresher feel is seen around the ship as 63,000 square ft of brand new carpeting has been laid. Over 2000 pieces of furniture, chairs, bar stools, sofas etc have also been reupholstered. 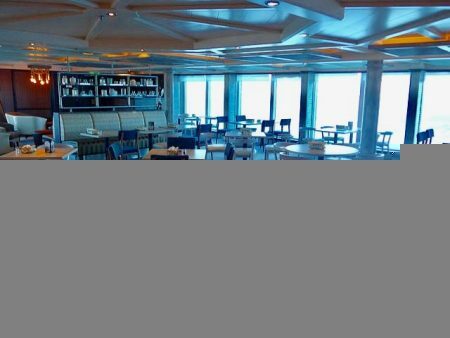 But the most exciting difference is the 7 new dining venues introduced onboard. 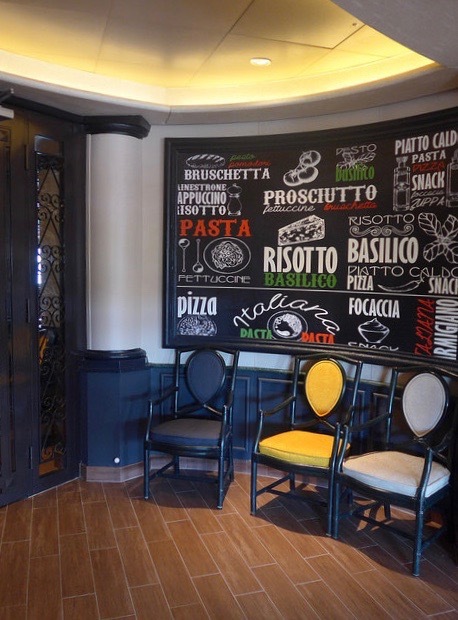 The Sabatini’s Italian trattoria on Promenade deck 7 has been refurbished to have a more contemporary feel. Unfortunately, it was closed while in port so couldn’t go in to view it, so only snapped a photo of the entrance. Even that tells you how the design has moved on for about 15 years. Gone are the fake roman pillars and dated frescos. They have been replaced by lighter, sleek lines and dots of colour. 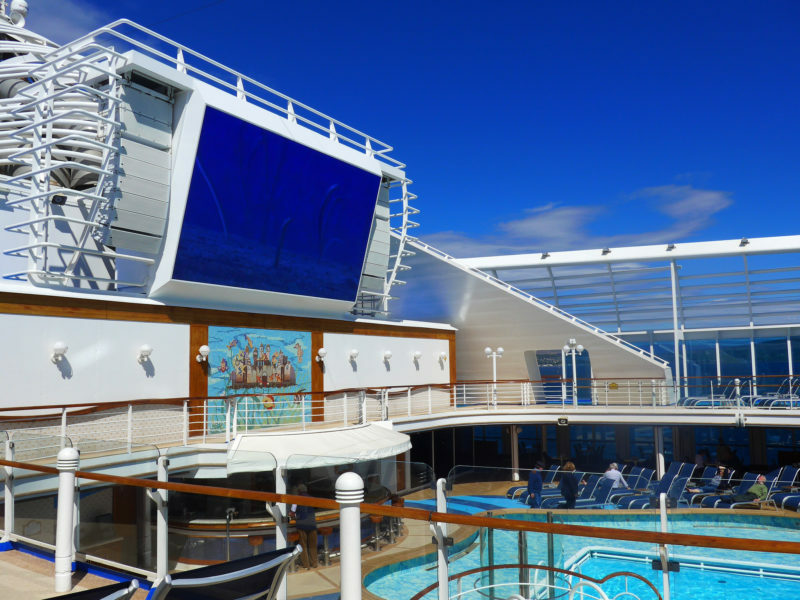 The biggest change you will see is up on the Lido deck. 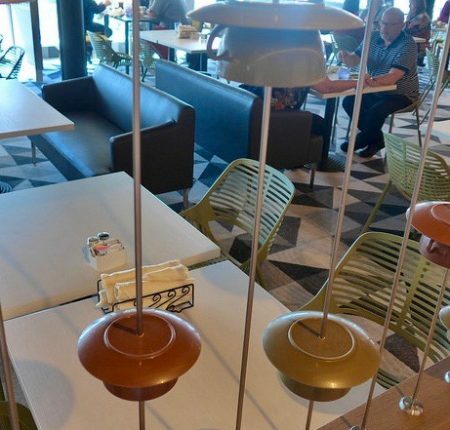 The Lido casual dining venues have had a smart, bright facelift. At the poolside, you have the new Salty Dog Grill (replacing Trident). It has an upgraded and extended menu – now offering tacos too (one vegan option). The pizzeria on the lido has been rebranded to Slice and looks much smarter. It serves not just pizza slices but focaccia and other oven-baked cheesy bread treats. No vegan cheese, though, I must add and for food hygiene reasons staff won’t use guest’s own cheese. But you can always add your own to the freshly cooked pizza pie. 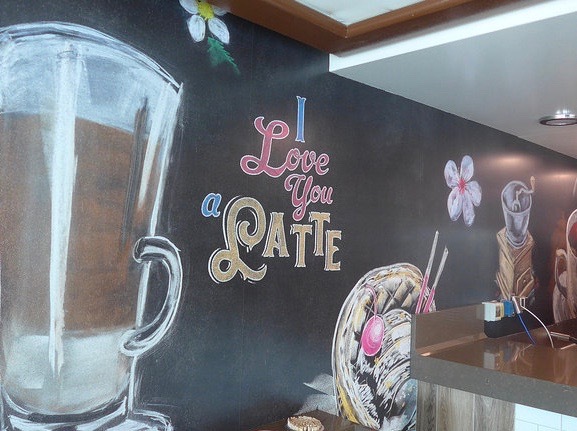 Another new addition is Coffee & Cones for ice cream sandwiches, milkshakes, coffees and frappes. Great treats for hot days on the Lido! Previously on Princess, I have been able to get soy milk for coffees and sorbet instead of ice cream. During our tour, Coffee & Cones was shut so I wasn’t able to check what they were serving and how dairy-allergy/vegan-friendly it would be. 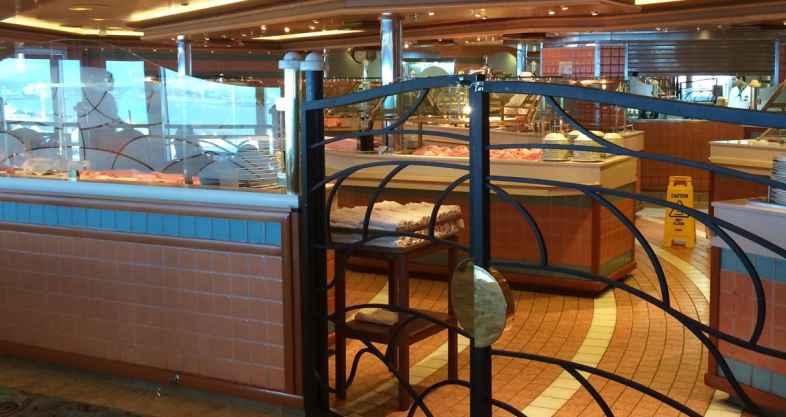 If you have previously been onboard you’ll remember what the buffet was like. I realised that during last year’s visit I mostly took photos of the vegan food served – not so much of the venue and the furnishings. These are the images I found to give you some idea of how the buffet used to looked. 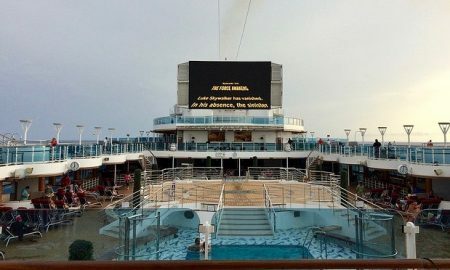 ( Two “before” images kindly given for comparison by Princess Cruises UK media). 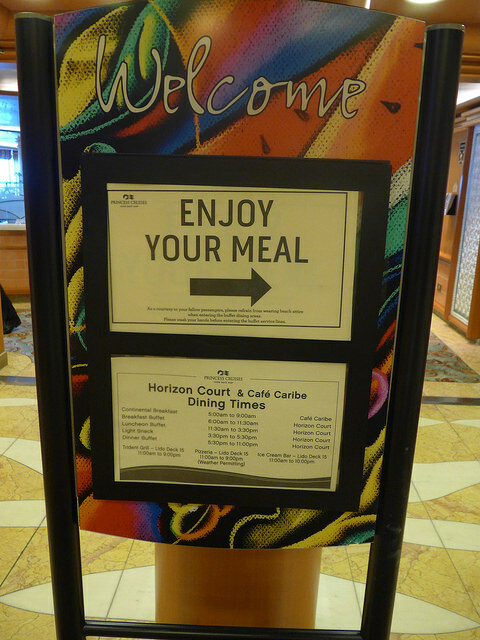 The old buffet consisted of two parts ran onto one another: the more mid-ship Horizon Court and Cafe Caribe in the aft. 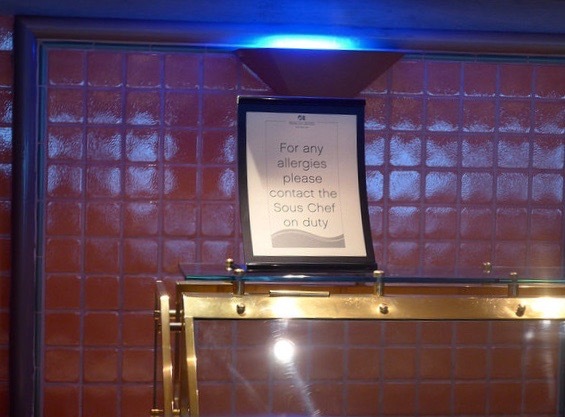 It was a perfectly nice buffet, but with hindsight, it can be said that the decor was rather dated. The floors were covered in swirly carpet and the restaurant was decked with heavy upholstered furniture. Their transformation is utterly mesmerising. 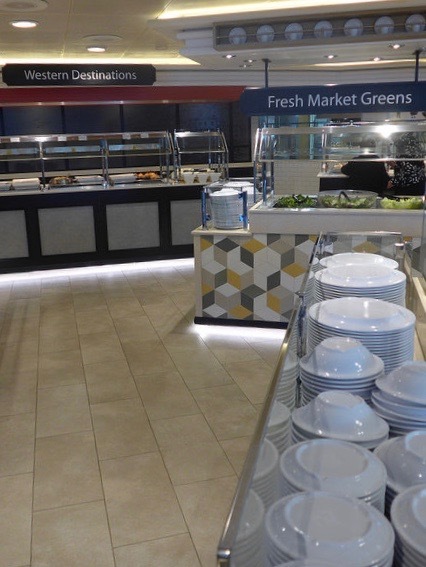 Prepare to be amazed as you walk into the brand new World Fresh Marketplace buffet this season! 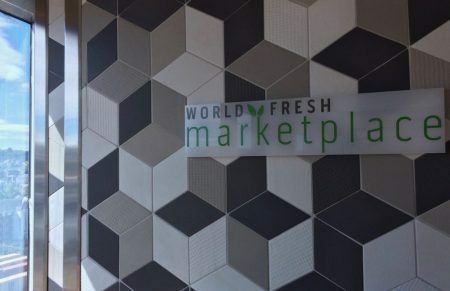 World Fresh Marketplace is now an airy, contemporary affair with light colours and furniture to match. 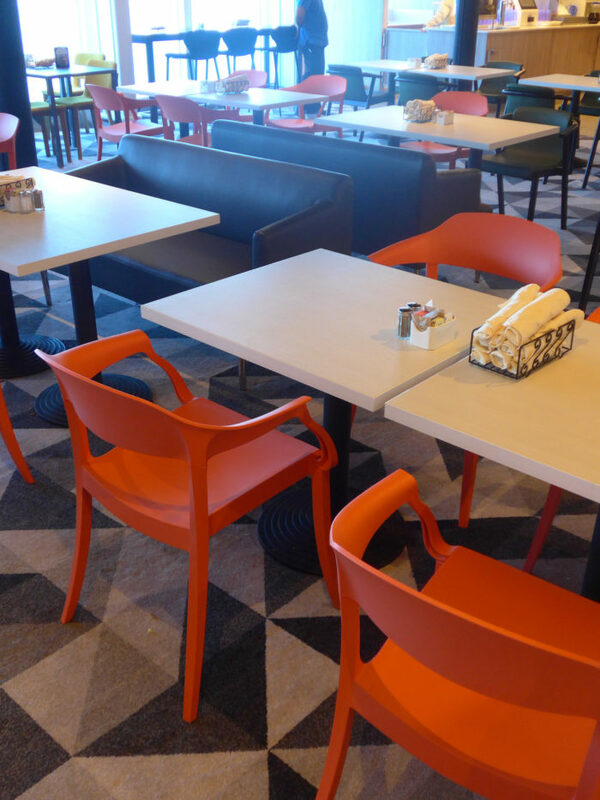 The new dining space utilises a combination of seating styles & colours, keeping the area contemporary and interesting. An absolute delight! My favourite piece probably was the use of upside-down cups & saucers suspended on thin metal bars to create space dividers. Quirky! 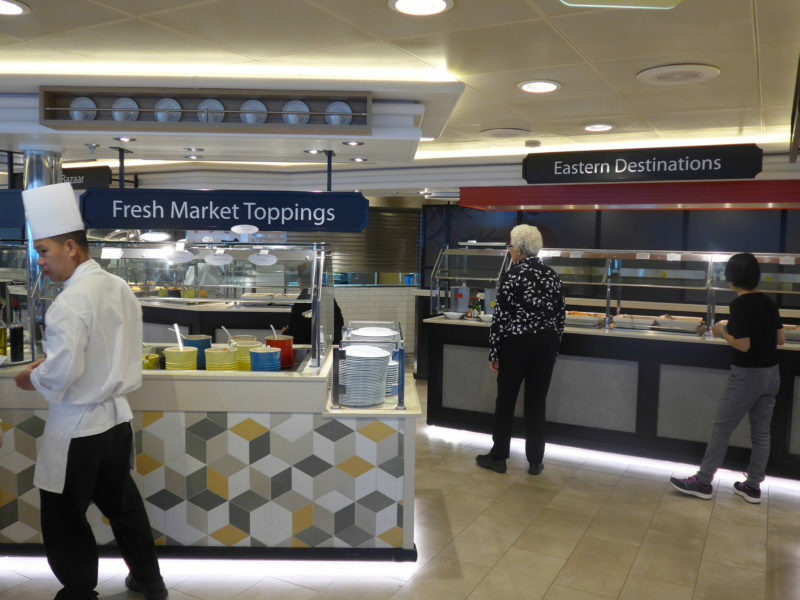 The serving lines/stations have also been replaced by lighter, modern units & signage as you can see from the photos I took on the day. Much improved! 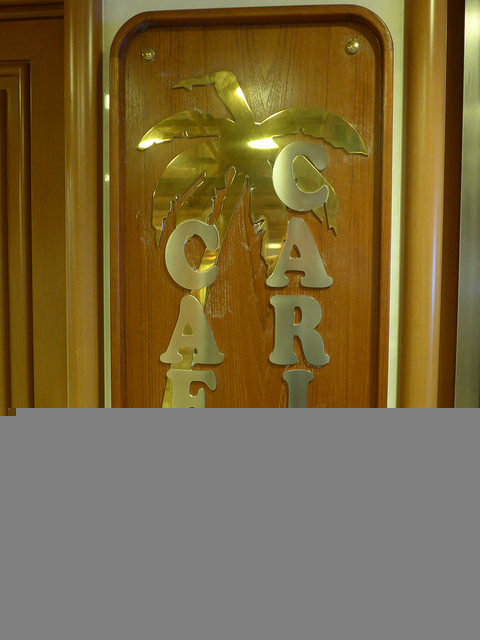 Where Cafe Caribe used to be in the aft, two new evening dining venues have been created in its place. These flow seamlessly from World Fresh Marketplace and can be used for extra seating at lunchtime. 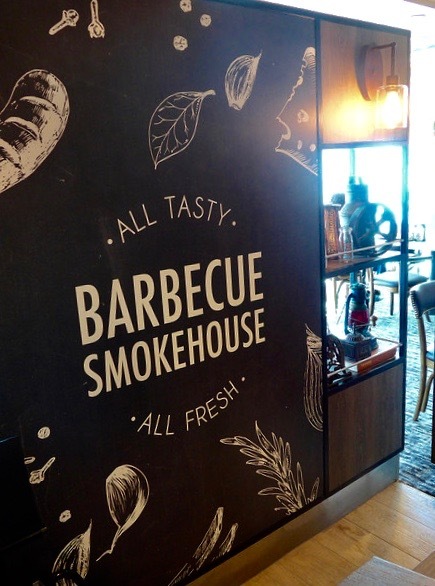 In the evenings you’ll find Planks BBQ here: a brand new, waiter-service restaurant on the aft starboard side. 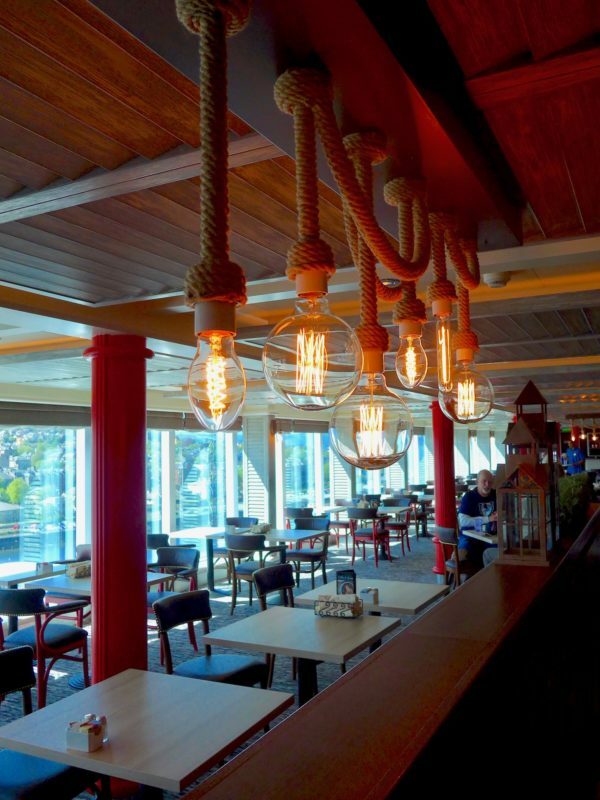 On the port side of the former Caribe, you will find Steamers seafood restaurant. Both o f these new evening dining venues carry a nominal 12USD cover charge (at the time of writing, 2017). They’re an affordable addition to passenger evening dining choice – but only if you are omnivore or pescatarian, or sail with friends or family who are. Thankfully as we sat down to sample lunch from the World Fresh Marketplace their vegan selection greatly surpassed last year’s offering. 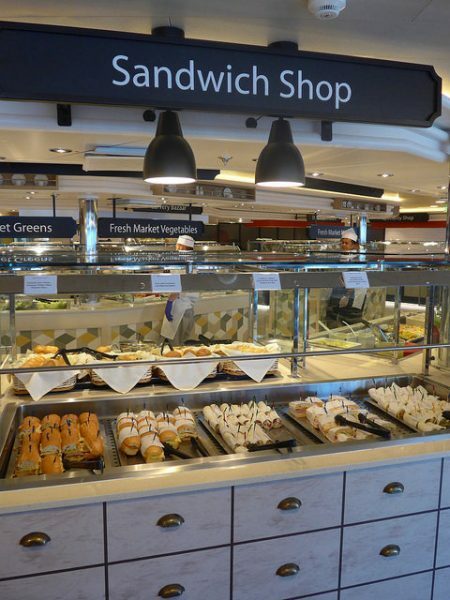 As expected, there was an extensive salad bar with a beautiful selection of freshly baked bread and rolls. Unfortunately, Princess doesn’t offer dairy-free spread for those of us who have dairy allergy/intolerance or are vegan. The selection of warm dishes suitable for vegans was greater than last year and I couldn’t sample them all – not in the time we had and the space I had available in my stomach. There was cilantro (coriander) lime quinoa, Cuban black beans & rice, fried cubed potatoes with onion and peppers, baked sweet potato, Thai rice and lots of other prepared vegetables. The selection of warm dishes suitable for vegans was greater than last year and I couldn’t sample them all – not in the time we had and the space I had available in my stomach. There was cilantro (coriander) lime quinoa, Cuban black beans & rice, fried cubed potatoes with onion and peppers, baked sweet potato, Thai rice and lots of other prepared vegetables. 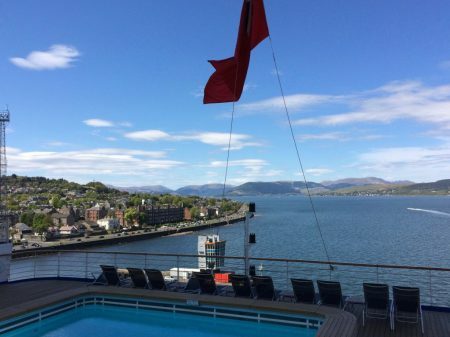 As the weather was gorgeous we took a stroll on the deck and admired the various pools, the sun and the views on the Clyde. 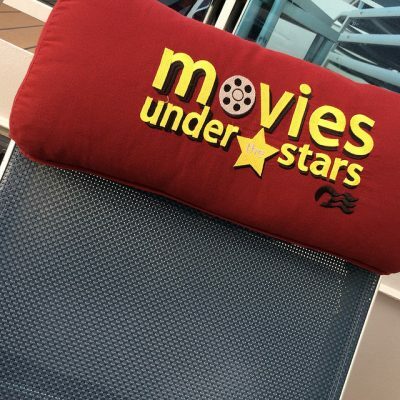 But one view goes with the ship everywhere – the brand new Movies Under the Stars HD screen for films on the deck. 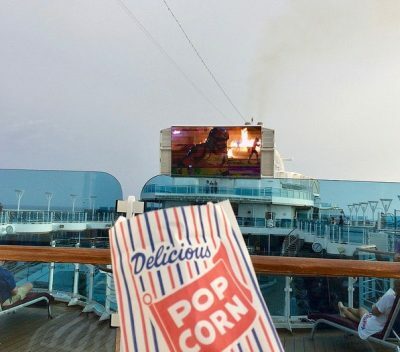 Our tour of the Caribbean Princess was too early for this but here are some photos from our August sailing on Royal Princess, enjoying a film on the Mediterranean. Can you tell what it was? As we were blessed with beautiful weather, we were also able to visit the Sanctuary. 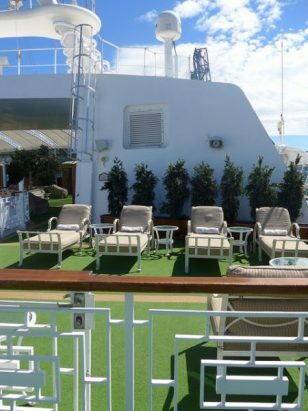 We had missed this dedicated adults-only deck area with a pool and loungers in last year’s tour as it was raining. 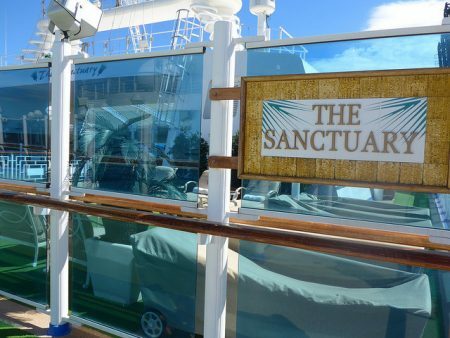 You can pre-book these popular Sanctuary loungers for the duration of your sailing. Alternatively, there are limited half-day passes you can book for 20USD bookable onboard (prices correct at the time of writing 2017). 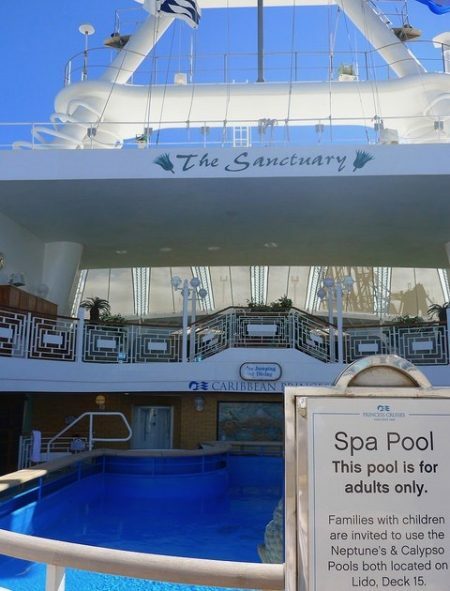 If you don’t want to escape the kids and in fact are travelling with family, during this dry dock Princess has upgraded all three kids’ club venues. Princess also created more interconnecting cabins making family travel easier, and more spacious. The three totally refurbished clubs are Discovery themed to tie in with Princess’ Discovery at Sea programme. These are Treehouse for ages 3-7, The Lodge for 8-12 and the Beach House for the teens (13-17). Camp Discovery runs while ships are at port allowing parents to leave their children in the care of the dedicated kids’ club workers – which is why we weren’t able to photograph the venues in port. But for those of us who travel as a couple, as Mr Vegancruiser and I do, there is a new welcome addition to stateroom/cabin categories onboard. Caribbean Princess now includes a whole new Club Class Mini Suites section with premium cabins. The Club Class offers perks like priority embarkation and dining (expedited seating). As expected, Club Class also offers extras like better dressing gowns, daily canapes and 2 small bottles of wine upon embarkation. So the theatre may not have changed or the shopping venues but the two things that matter the most have – comfortable sleep and upgraded dining with the Ocean Medallion features. 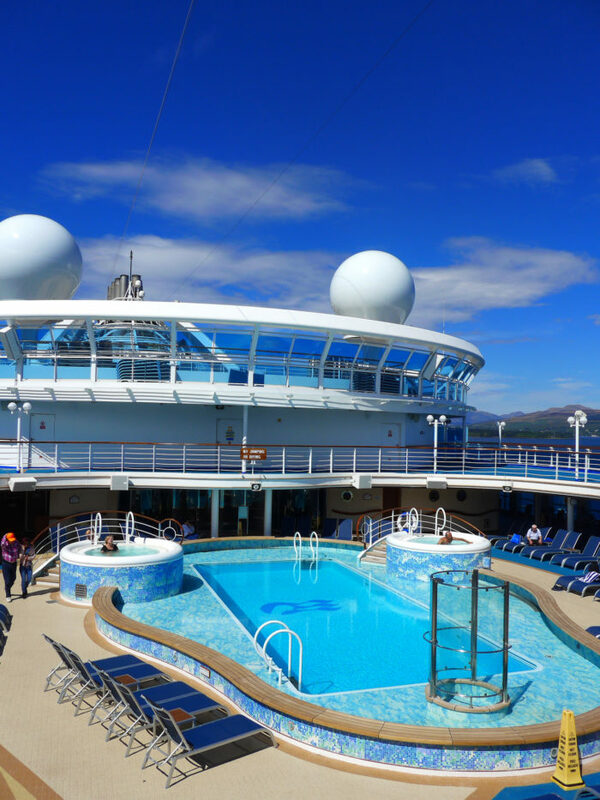 Plus, like last year, I must say that I love Caribbean Princess for the aft pool and the best-designed aft nightclub there is, Skywalkers. Those views! Skywalkers: a club so cool you don’t even need to haul your own *ss to it. 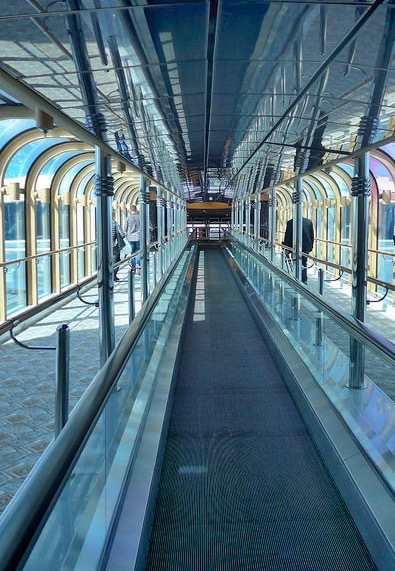 There’s a travelator taking you up to the venue! 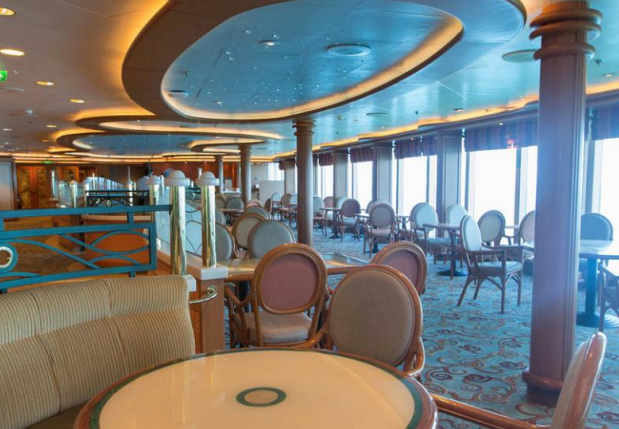 Would that time-lapse convince you to sail on the refurbished Caribbean Princess? 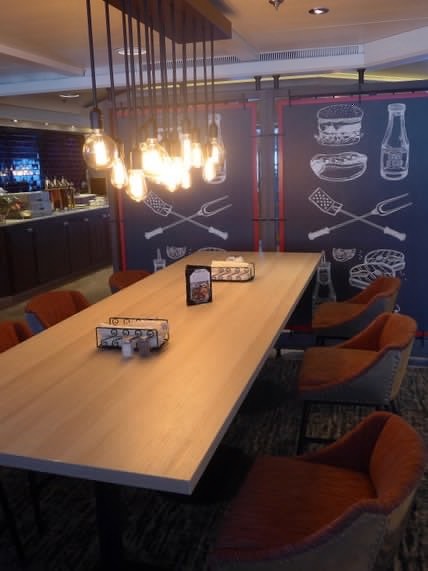 It certainly convinced me – I do enjoy her newer bigger sisters Royal and Regal, but the fresh youthful design features as seen in the Caribbean Princess buffet and in the new dinner restaurants appeal to me more. And the Skywalkers. I just can’t help it but I love that design! As I mentioned above, I have visited and sailed on larger and newer sister ships in the fleet. I did enjoy those, but somehow much prefer the size and design of Caribbean Princess. She’s still a good size without being too big and the Ocean Medallion readiness of Caribbean Princess, paired with the new 2017 dining options, make her stand out from her newer larger sisters. 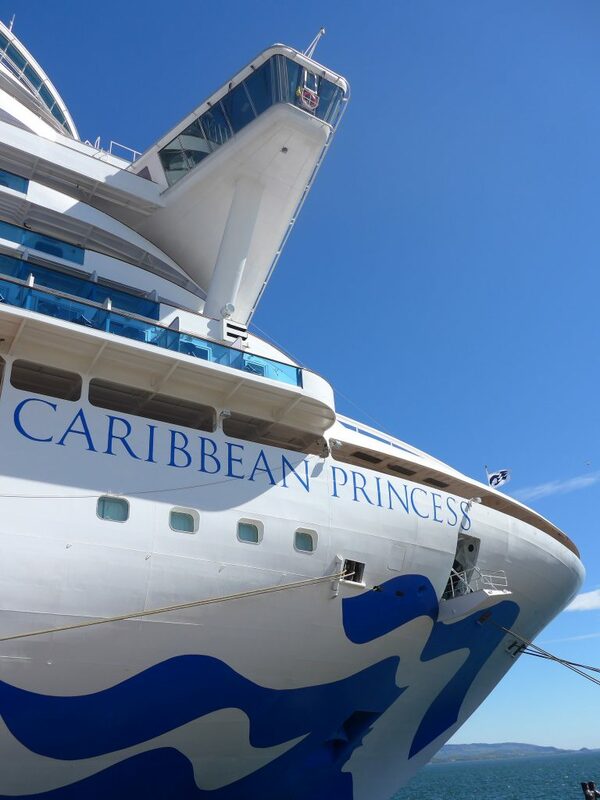 Now in 2019, there is yet another bit of new & exciting news to share regarding Caribbean Princess – and Princess’s reputation as a family-friendly cruise line. A fresh new refurbishment feature arriving shortly! 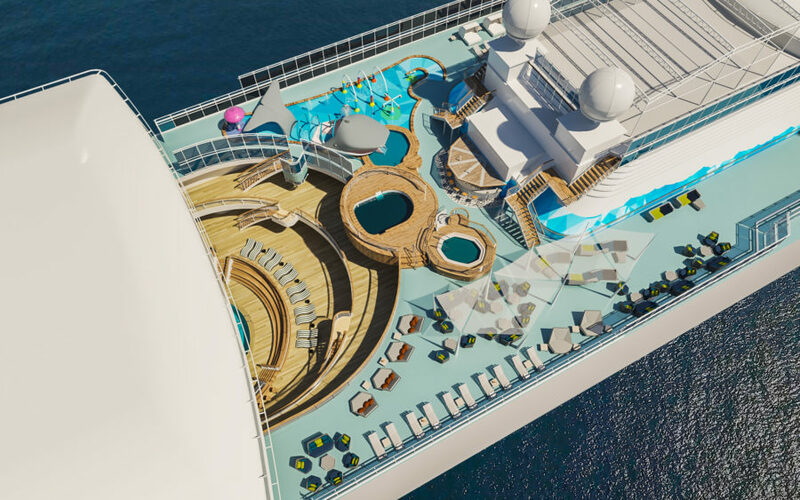 For the start of June 2019 Caribbean cruise season, Caribbean Princess will host a new deck enhancement that will surely excite family cruisers: an interactive, top-deck family splash zone called The Reef in the aft of the ship. A Princess first and much-awaited addition in my opinion! The Reef is a water playground with a splash pool, assorted sprays and showers and an interactive whale water feature. There also is an oversized game zone with giant Connect Four and Jenga for families to play with – even a family-friendly bar serving mocktails, and cocktails for the parents. The pool, jacuzzi, seating and furnishings will be upgraded too, including canopies and wind panels. 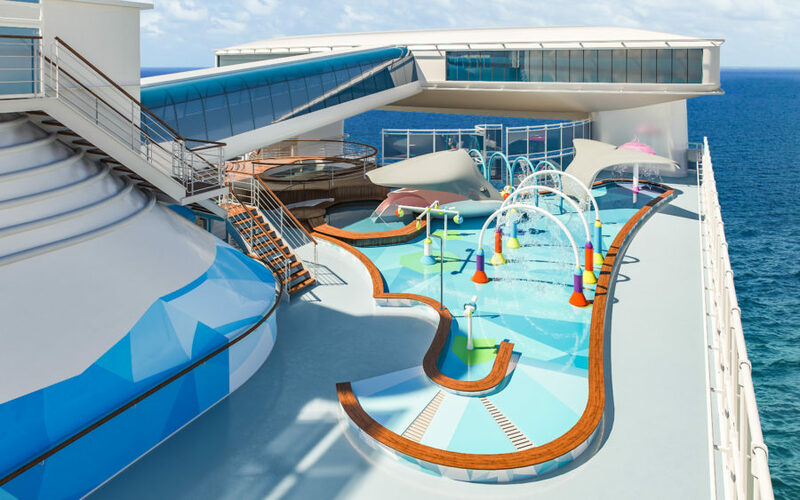 All of this will complement the earlier 2017 refurbishment of the Discovery Channel themed kids’ facilities making Caribbean Princess a great destination for family cruising. Anyone else excited about this latest addition? I don’t even have kids, but I am so pleased to see this facility onboard. I started cruising as a kid and I would have loved something like this! 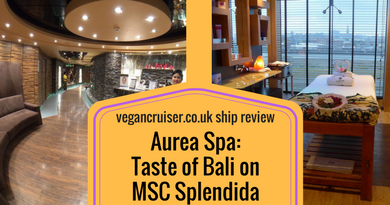 I am a big fan of Princess Cruises for their quality service and standard of care onboard – and especially the vegan options they have so kindly provided us when we have been onboard. They still don’t have a vegan fleetwide menu onboard, but they are not just willing and often able to provide good nutritious vegan food. See more about my Royal Princess vegan experience here – our Crown visit will be another blog post altogether. 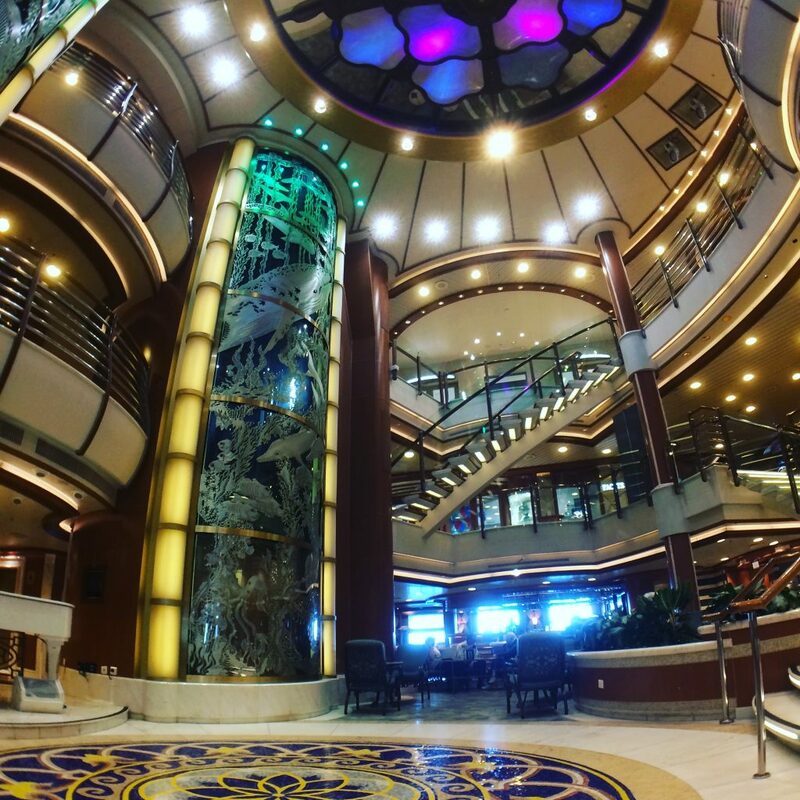 Any questions or comments regarding Princess Cruises, please do comment below or reach out to me via Twitter or Instagram! 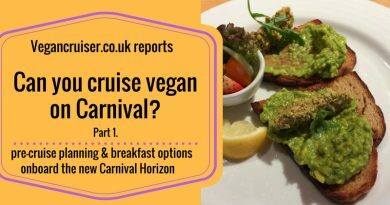 If you have sailed vegan on Princess and would like to share your review with other blog readers, please do contact me at Sanna @ Vegancruiser.co.uk! 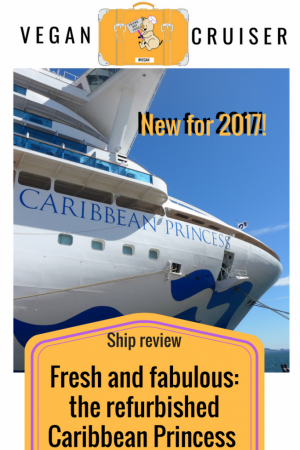 For more photos and information, see my Caribbean Princess 2016 review here. 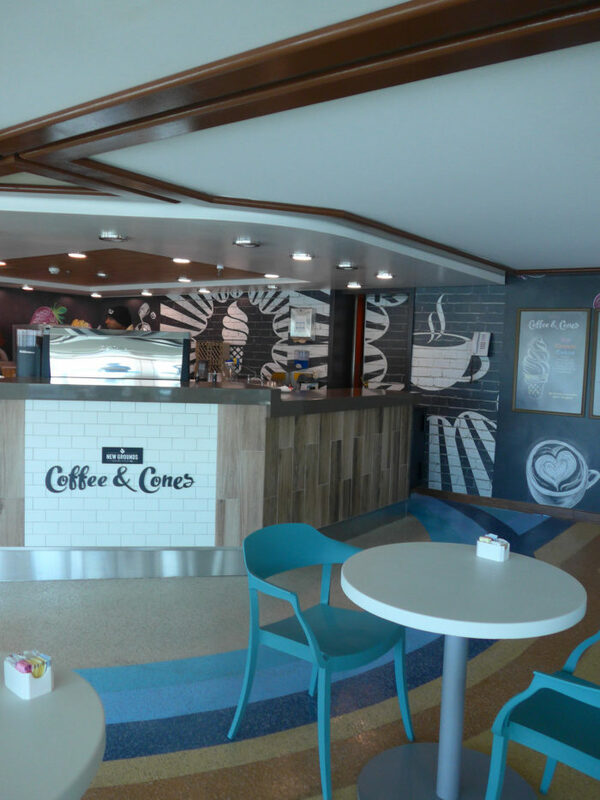 ← Princess Cruises gets more vegan friendly with a new wine list! Wow, that’s a big ship. I’d be keen to book the adult’s area but with 3 areas for kids, it’s unlikely they’d be under my feet anyway. We’ve only cruised a couple of times but quite enjoyed it. Wow! It sounds like they have made some great renovations! 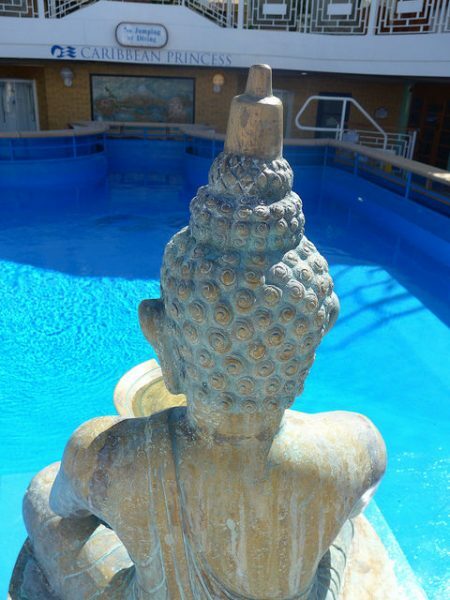 I’ve only been on a couple of cruises, but loved the variety of activities and food. She’s really a princess! This is an awesome boat!